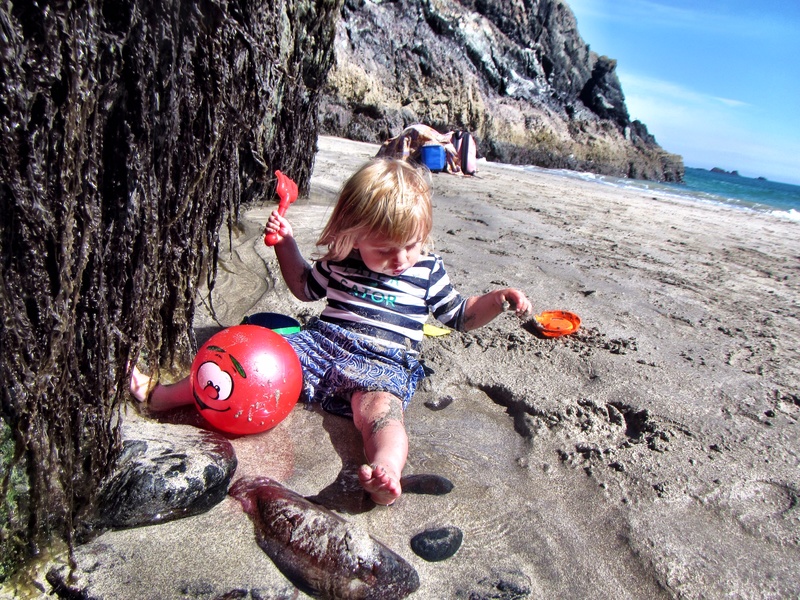 Continuing the themes of exploring and beach fun that ran through our trip to Cornwall last week, we spent a fantastic afternoon at Kynance Cove. It’s not an easy beach to visit. To start with you have to get the tides just right: at high tide there’s no beach at all, just the waves crashing around the serpentine rocks. Then there’s the walk down from the car park – incredible views but steep and slippery. There is a route that’s apparently suitable for pushchairs but I was very glad of my Connecta! Once we made it down, though, it was clear it had been worth the effort: turquoise waters, white sand, and dramatic cliffs rising high above us. 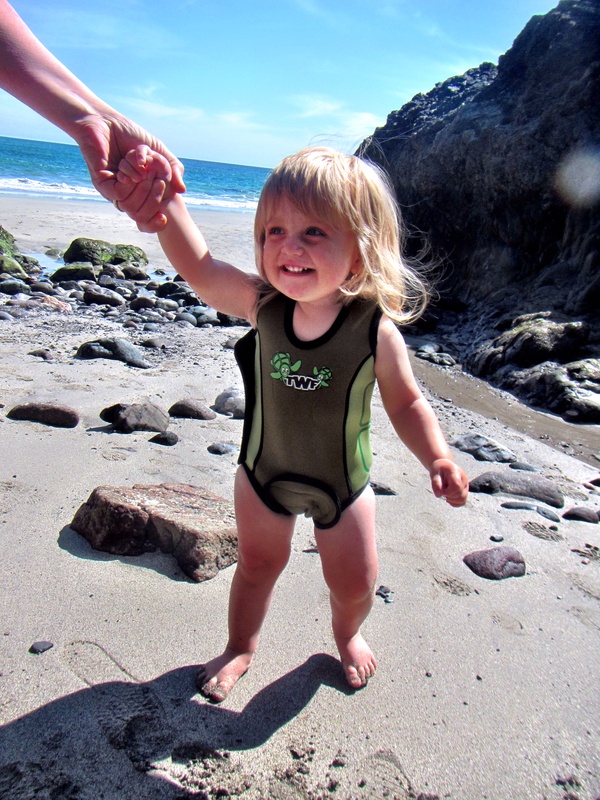 He was much happier once we’d stripped him off and put him in his little wetsuit – raring to go and explore! Another layer to protect him from the sun and he was off – running towards the sea with us following in quick pursuit. He loved sitting in the sand with the water swirling around him, but even though I was right there this did begin to make me nervous – there are some pretty vicious rip tides at Kynance at low tide, and even in the shallows things looked a little unpredictable. We managed to distract him for a while with the pools that formed by the rocks. 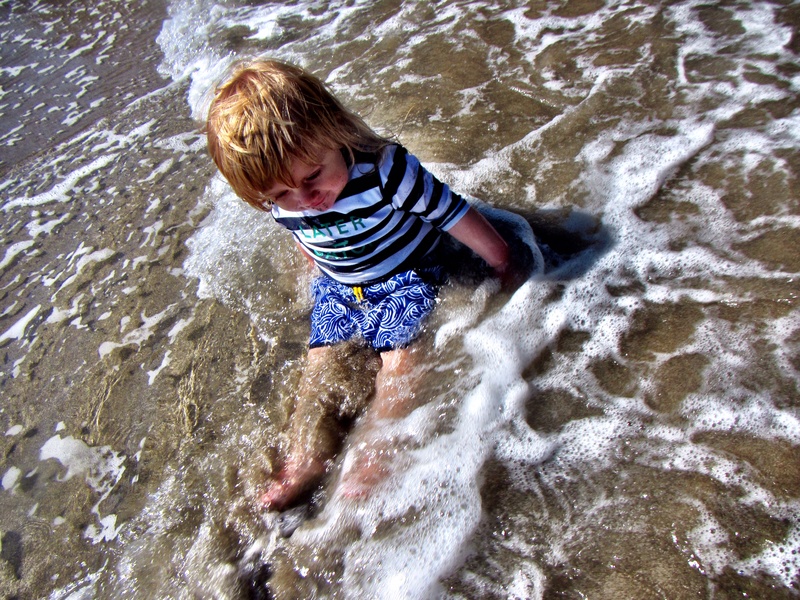 He was curious about the seaweed strands that hung down and tickled his toes, and spent ages flicking sand onto his legs to watch the patterns that it made. When he was ready to head back towards the sea we managed to divert him into a larger pool that had formed in the sand. He loved splashing around at its edges, and a couple of times tried to fling himself in for a swim! After a while even Arthur began to get chilly, but soon warmed up with an impromptu game of football. He loved chasing around after the ball, and even managed to kick it a couple of times! He hasn’t managed that before, and was almost as impressed as me with his new skill. 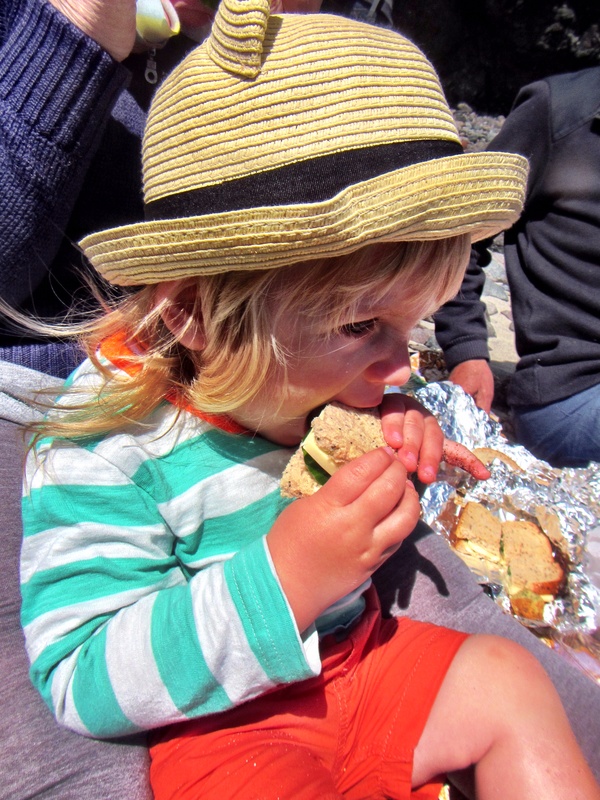 He was less impressed when we told him it was time to go – I swear my little boy would happily live his life on the beach if we let him! But he soon began to realise the appeal of being warm and dry and was all smiles again before too long. 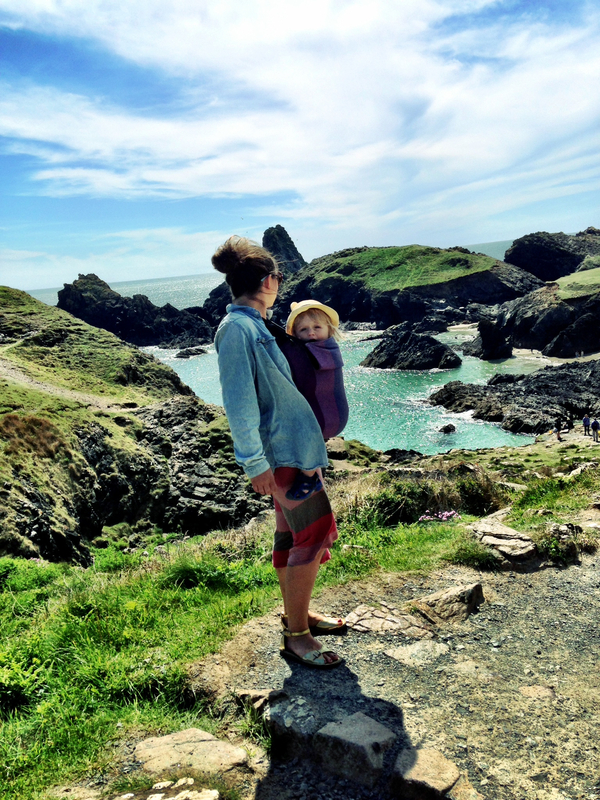 This entry was posted in Sophie is parenting, Sophie is travelling, Uncategorized and tagged beach, Cornwall, Kynance Cove, toddler on May 26, 2014 by sophieblovett. We have a beach we call the “secret beach” which looks just like that. Even in August we can be the only ones there as it is a hike along a coast path to reach it. 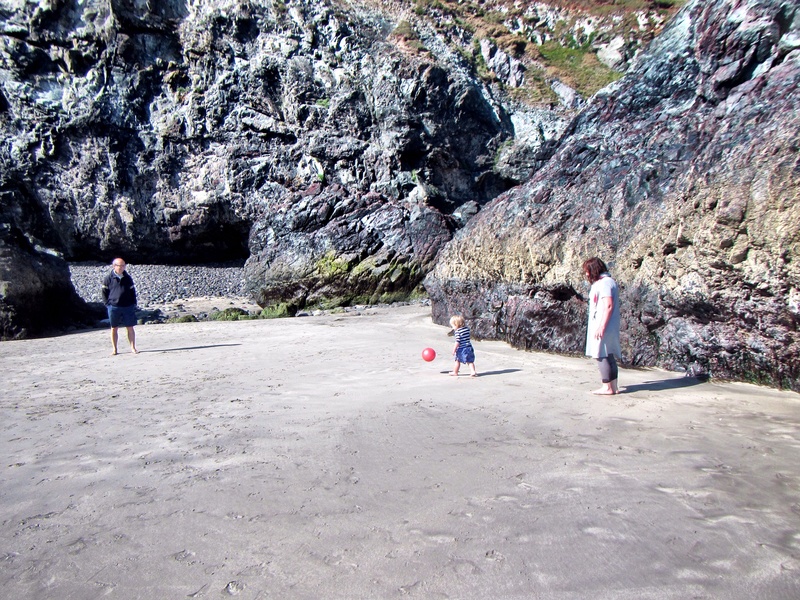 To me these are the best beaches here in Cornwall. Glad you discovered one and hope this one comes to Country Kids next week. 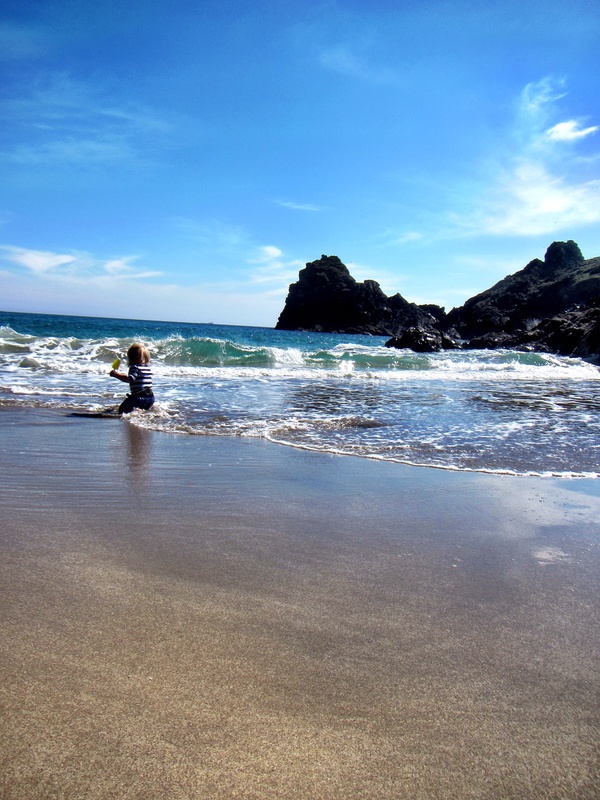 We used to spend endless summers there too – nothing quite like the beach for letting off steam! I love that photo too 🙂 He really was having the best time – looking forward to lots more beach days this summer! Thanks Merlinda 🙂 I mainly just use my iPhone to be honest, but the trick is in the camera+ app – it has a feature called ‘clarity’ which just seems to bring out all the colours so it’s more like what you actually see. Without it I feel like the pics can be a bit flat – I know I could probably solve that with a better camera but I rarely remember to bring it with me! Looks beautiful and soooo much fun! What a lovely beach. 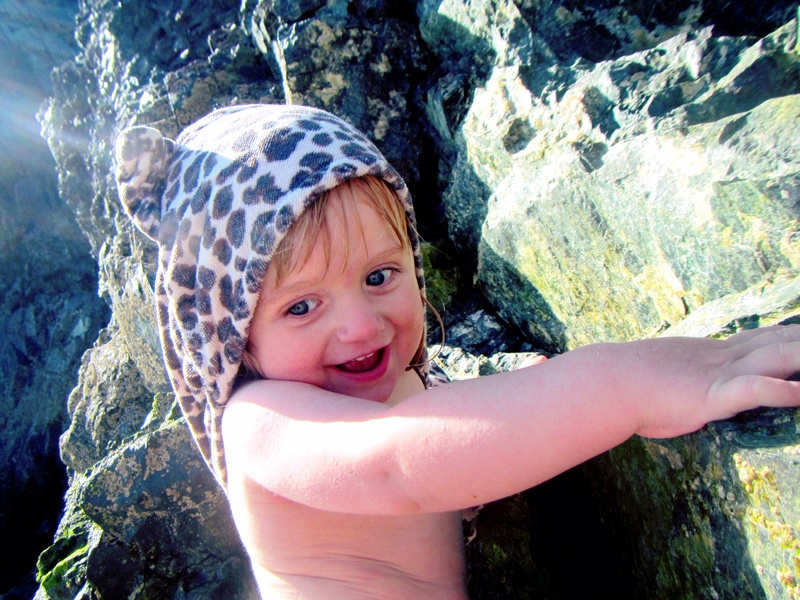 I remember rock pools as a child, I really hope my kids get to experience them some time. It looks like he had a great time. 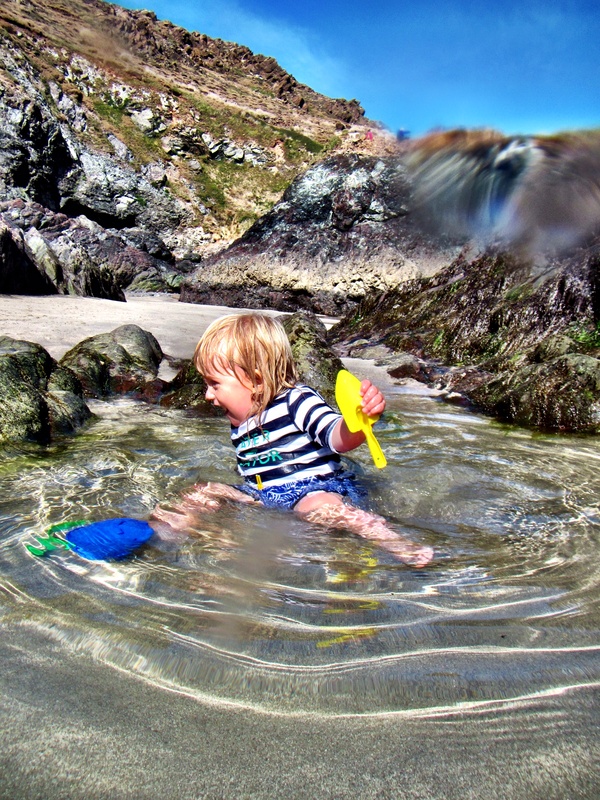 He really did – I have a feeling we’ll be spending lots of time in rock pools this summer!